Salem will look like a mid-winter’s night dream on Saturday, Feb. 10 when dozens of illuminated ice sculptures beckon even the most thin-blooded to bundle up and stroll the historic city’s streets. As if the magic of glistening ice sculptures were not treat enough, there will also be delectable chocolate samples, trolley rides and discount Valentine’s Day shopping during Salem’s sweetest event of the year: the 16th annual Salem’s So Sweet Chocolate & Ice Sculpture Festival. From Friday, Feb. 9 through Sunday, Feb. 11, Salem Main Streets, the Salem Chamber of Commerce, Destination Salem, and local businesses work together to create the much-anticipated weekend that helps distract from the long, cold slog of New England winters. The festival kicks off officially on Friday, Feb. 9 with a Chocolate and Wine Tasting at Colonial Hall at Rockafellas, 231 Essex St. from 6:30–8:30 p.m. Featuring wine and chocolate samplings and music by Molly Pinto Madigan, the event is the highlight of the season and sold out early in past years. Tickets are $30 and can be purchased in person at the Salem Chamber of Commerce, by phone at 978-744-0004 or online at salemsosweet.com. In celebration of Valentine’s Day, many downtown businesses will offer free chocolate samplings and sweet discounts. The “Golden Ticket” is a 10 percent discount valid Feb. 10 and 11 only: shoppers making a full-price purchase at one participating downtown business receive a 10 percent discount off the next purchase at a participating business. The tickets are inserted in brochures found throughout the city. Photographer John Andrews, whose organization Creative Salem supports community-based festivals and often teams up with Salem Main Streets, said Creative Salem has introduced two new Salem’s So Sweet events this year. Galentine’s Day at Ledger restaurant on Saturday, Feb. 10 will celebrate ladies celebrating ladies. Inspired by the Amy Poehler character from the show “Parks and Rec,” the event features a nighttime brunch, DJ and photo booth. For more information or to purchase tickets, visit eventbrite.com/e/galentines-day-at-ledger-tickets-41705352833. On Sunday, Feb. 11, from 10 a.m. to 6 p.m., Creative Salem will host the first Pop Rocks Pop Up Craft Market at Old Town Hall, with dozens of local artisans. Even though Salem is abuzz with these various exciting activities and events, the ice sculptures steal the show as well as people’s hearts. Last year, there were a record-breaking 25 ice sculptures installed around downtown and for the second time local company Retronica illuminated them on Saturday night “which really adds a whole new sense of celebration in the face of February’s cold, dark nights,” said Salem Main Streets Executive Director Kylie Sullivan. Sullivan has two favorite festival moments. One is about mid-day on Saturday, when everyone begins discovering the sculptures for the first time. “But the illumination on Saturday night has also become one of my favorites,” she said. “To look around and see the downtown so full of people of all ages, locals and visitors – on a night in the middle of February when you wouldn’t normally see anyone out – is so cool and is really the reason we have the festival in the first place,” she said. Elaine’s dedication to social issues and activism extended to the family supper table. “We encouraged our kids to participate and be knowledgeable of what was going on around them politically,” she said by email. Her mother’s community involvement and growing up in Ipswich, where she and her brothers were the only Jewish kids in the entire school district, shaped Noss’ career choices and her commitment to social justice and interfaith community building issues. “Ipswich has always been ethnically and economically diverse,” Noss said. When the educator and mediator returned to the area years later, she followed in her mother’s footsteps, joining the Beverly LWV, co-chairing two local studies on domestic violence and child abuse, and serving as its co-president. 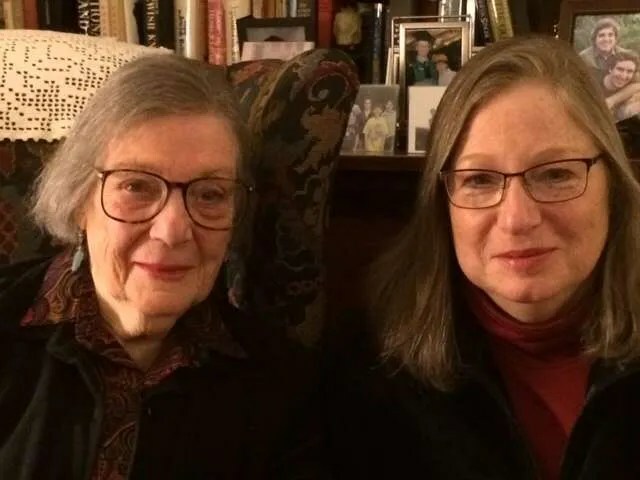 Mother and daughter remain dedicated to tikkun olam (“repairing the world”) at Temple B’nai Abraham in Beverly and throughout the North Shore and Essex County, their multi-generational commitment spanning half the temple’s history. On January 12 at 7 p.m., the TBA Social Action Committee will acknowledge them at its Social Action Shabbat with the third annual Leah Shriro Social Action Honor, which pays tribute to members who represent the best of TBA through their community involvement. The inclusive Shabbat service includes a speaker and reflections from Dr. King, Rabbi Abraham Heschel and other sources that fit with themes of social justice and interfaith activism. The social action award was created in 2016 in memory of Leah Shriro, a longtime temple volunteer and founder of the Social Action Committee who died in 2015 at the early age of 62. The award brings into focus and salutes the passionate dedication of members who have been working for social justice and creating caring community both within TBA and in the world at large. In addition to her work with the local and state-level LWV, Israelsohn also served on the board of Bridging the Generations, a Beverly coalition that dealt with social issues and city-wide preventative programs, and represented TBA on the Beverly Interfaith Council. She served on the temple’s board for many years, including as vice president, and created its historic archive collection. “Preserving the history of our community is so important and she has done so with great love,” Rabbi Adler said. The seed for Noss’ work embracing interfaith marriage and community relationships was planted when she moved back to the North Shore in 1985 and started attending temple programs as a young interfaith family. “It became clear at High Holiday and regular services that in a Conservative congregation, the Jewish spouse was expected to convert the non-Jewish spouse to Judaism,” she said by email. She met many other couples that were grappling with similar issues, including Leah Shriro, who became one of her closest friends. In response, she helped develop an interfaith family group for couples with and without children and parents whose young adult children were dating non-Jews. These families celebrated holidays together and discussed what it meant to raise children together. “Eve really helped change TBA into a more welcoming place for interfaith families,” Rabbi Adler said of the TBA past president.